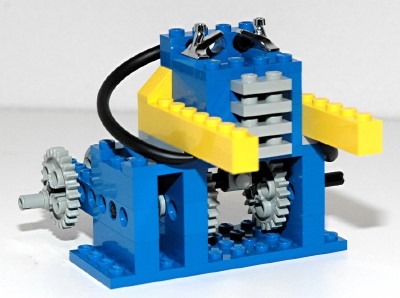 Set 858/8858 was released as an "Expert Builder"set, and was only available in the USA. It features instructions for 4 different engines: a 3 cylinder inline engine, a V6 engine, a 6 cylinder horizontally opposed (Boxer) engine, and a 2-cycle engine. Ironically, this last engine can not be considered either 2 or 4 cycle because there are no valves or transfer ports, making the term meaningless. 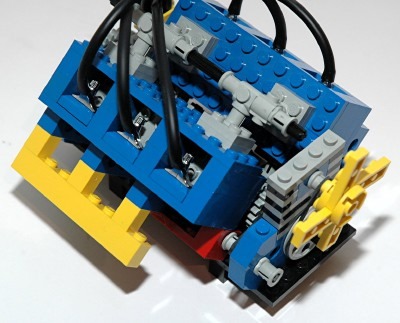 All of the engines feature reciprocating rectangular pistons, spark plug wires, and belts. Other features vary by model. 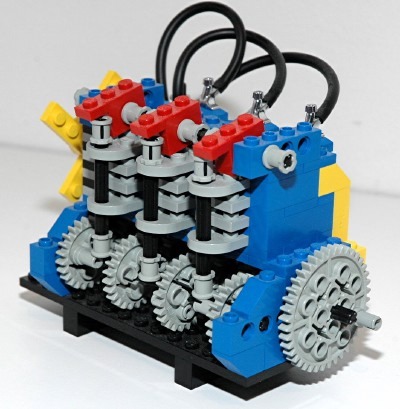 In a way, this set can be considered the first universal set in that it did not have any main model. There is a remarkable variety of functionality here considering the relatively small piece count. 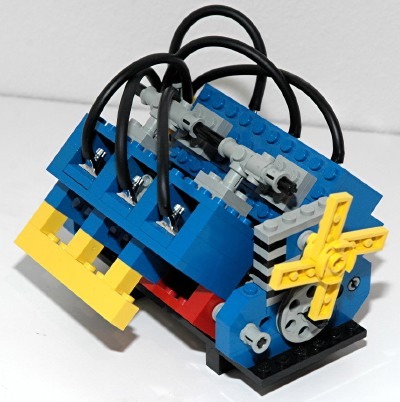 Each engine is significantly different and demonstrates different functions and varieties of real engines. 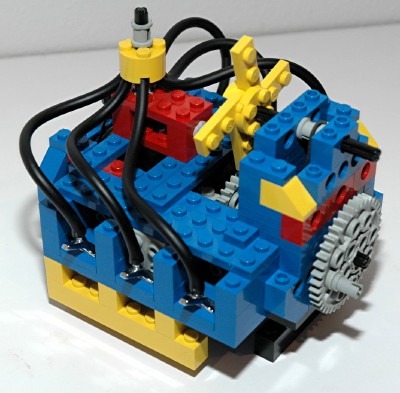 Photographs are included in the instructions for motorizing the first 3 engines using the 870 motor and battery box. The instructions for this set are one of only a few examples which actually have a significant amount of text (most are pictorial only). These instructions are in English, and describe the typical function of each of these engines. 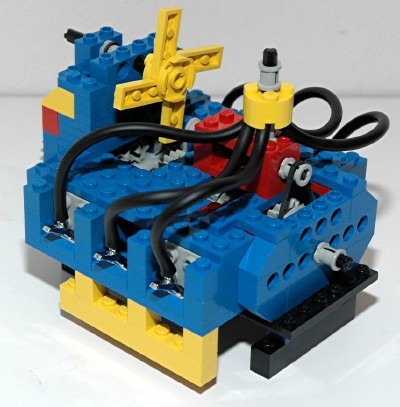 Since this set was available only in the USA, and since Technic has always been much more popular in Europe (for some reason), this set is extremely uncommon and very difficult to find. I paid more for this 240 piece set than for a brand new, motorized, 1400 piece bulldozer. 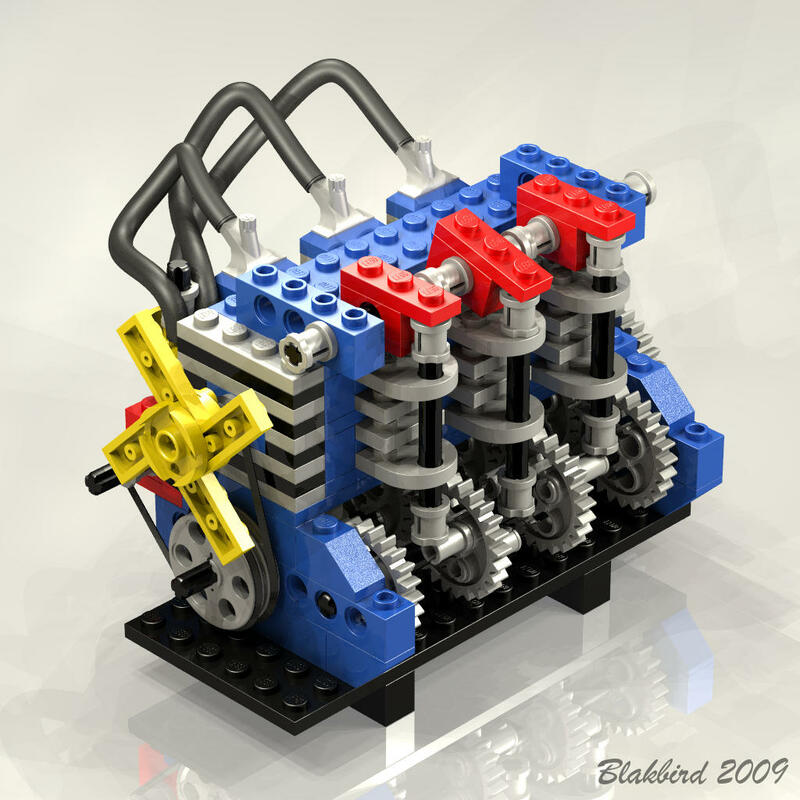 This engine is an inline 3-cylinder gasoline engine. How can I tell it is gasoline? Because it has spark plugs! 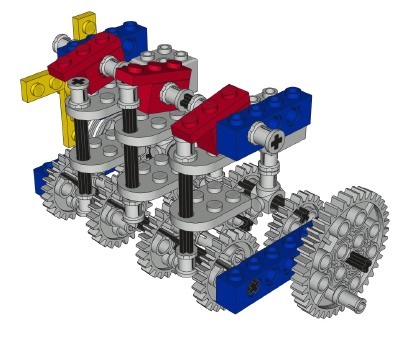 The engine uses the offset axle holes of the 24 tooth gears to make a crankshaft. 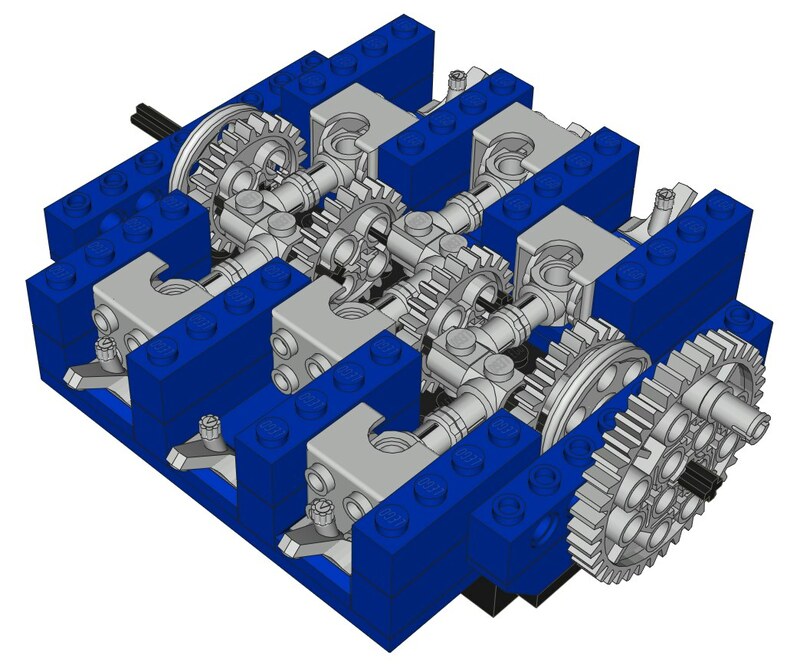 Due to the gear design, the crankshaft is flat plane, rather than clocking the crank pins 120° as a real 3 cylinder would do. Connectors placed end to end and clocked 90° form rods which connect to 3 specialized 2x2 square pistons. The "cylinders" are actually square. The engine is driven by a 40 tooth flywheel on the back end. On the front are a pair of pulleys (first seen in this model) which drive belts. One belt drives the fan, while another drives the distributor. Running parallel to the crankshaft is a cam shaft with 4-24 tooth gears. Pins are present in the offset holes of the gears. These pins act as lifters which drive push rods running up to tappets and rockers on the head. 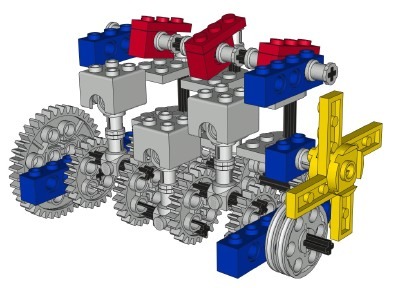 The push rods are guided by new 3x2 plates with centered holes at one end. 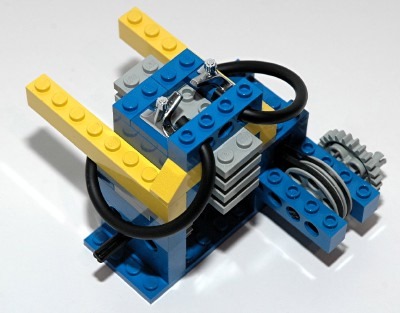 The cam shaft and the crank shaft rotate at the same speed but, due to two pins being in each gear, the rods cycle twice for every rotation of the crank shaft. This makes it kind of like a 4 cycle engine except that the same valve opens twice. Is it an exhaust valve or an intake valve? It doesn't matter. 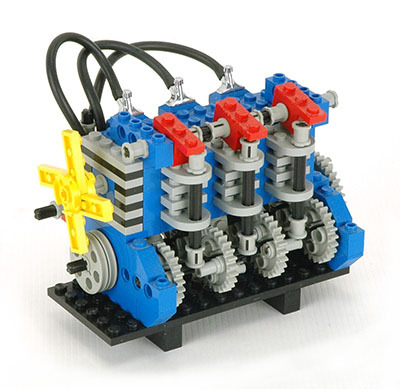 This is the only LEGO® engine with valves of any kind, so I'm just glad they are there. Due to the way the lifters hit the push rods, the engine can only be rotated one direction (clockwise). It will jam in the other direction. There are also a number of aesthetic features which do not actively function. The distributor features spark plug wires which run to each cylinder. Faucet parts are used for plugs. There are air cooling fins on each cylinder. An exhaust manifold runs down one side. 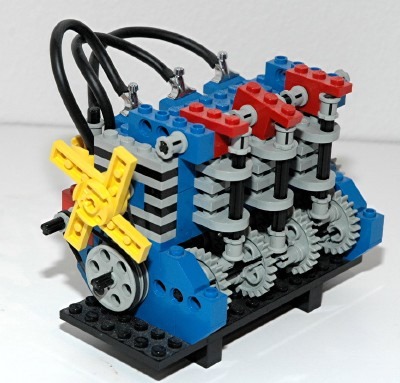 This engine is unlike any other made by LEGO® before or since, and is one of my favorites. Click for an animation of the inline engine in motion. This engine is a 6 cylinder "V", with the cylinder banks angled approximately 90° from each other. This type of engine is commonly used in automobiles, but 90° banks are seldom used on V6s due to vibration induced from imbalance. The function of the pistons is as described above, except that there are two cylinder banks. Most V6's have a separate crank pin for each piston, but this crank has just 3 crank pins, so each pair of opposite pistons share one. One oddity of these piston parts is that they sit side by side on the crank and do not overlap. The effect of this is that the cylinders on the right side are offset one stud from the cylinders on the left making the block asymmetric. This engine also has a belt driven fan and belt driven cam which runs along one side but does not attach to any valves. The distributor and plug wires are as described above. This engine also appears to have dual exhaust, or at least no Y-pipe is present. Click for an animation of the V-6 engine in motion. This engine is a horizontally opposed 6-cylinder gasoline engine. 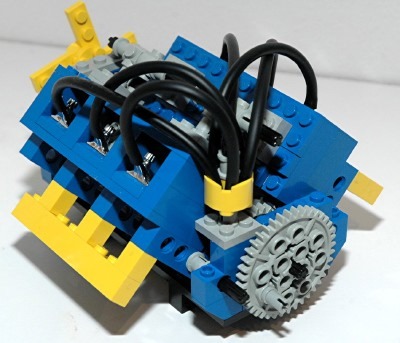 LEGO® calls it a "boxer" engine, and it looks like one, but technically it isn't. A real boxer has opposing pistons reach top dead center at the same time. This engine uses a flat plane crankshaft, so opposing pistons are 180° out of phase, as can be seen in the computer image. 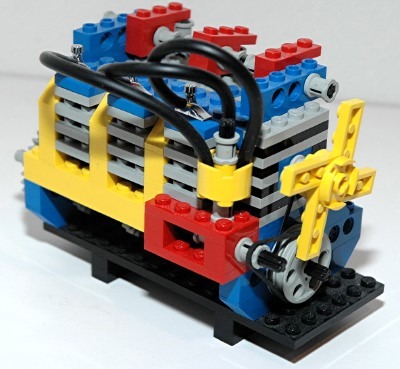 Note that LEGO has never made a cross plane crank, even with the newer engine parts, so a realistic V8 still remains elusive. The function of the pistons is as described above, and has the same type (in fact the same assembly) offset cylinder banks as the V6. This engine has an overhead belt driven fan and distributor. The belts are actually inside the block, making them very difficult to install. This is the only instruction I can recall which actually shows using a bent paper clip as the correct method of installation. If the paper clip slips off the rubber band, you have to tear apart the whole engine to get it back out. 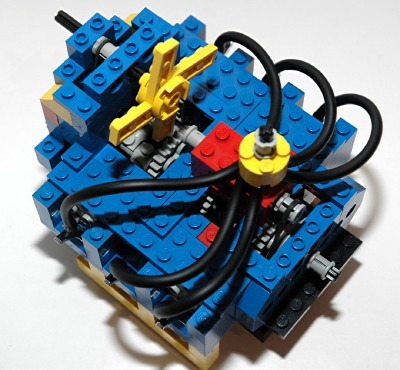 Click for an animation of the boxer engine in motion. This single cylinder, 2 cycle, fuel scavenging engine is the type which might be seen in a lawn mower or pressure washer. There are no exhaust or fuel transfer ports, so it cannot technically be determined to be a 2 cycle, but it looks like one. If not for the spark plugs, this might have been a diesel or nitro burning engine. The piston is belt driven from a pulley, which makes this engine turn about 4 times per revolution of the input crank. 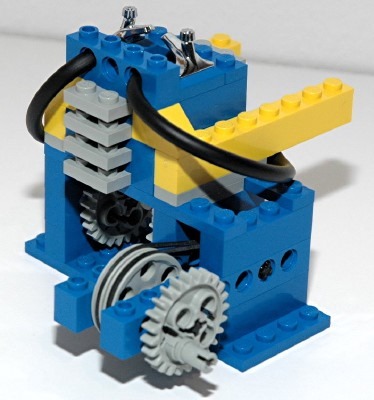 Click for an animation of the 2-cycle engine in motion.